The dual specificity phosphatase Cdc14 has been shown to be a critical regulator of late mitotic events in several eukaryotes, including S. cerevisiae, S. pombe. C. elegans and H. sapiens. However, Cdc14 homologs have clearly evolved to regulate distinct cellular processes and to respond to regulatory signals important for these processes. The human paralogs hCdc14A and B are the only vertebrate Cdc14 homologues studied to date, but their functions are not well understood. Therefore, it is of great interest to examine the function Cdc14 homologs in other vertebrate species. We identified two open reading frames from Xenopus laevis closely related to human Cdc14A, called XCdc14α and XCdc14β, although no obvious paralog of the hCdc14B was found. To begin a functional characterization of Xcdc14α and XCdc14β, we raised polyclonal antibodies against a conserved region. These antibodies stained both the nucleolus and centrosome in interphase Xenopus tissue culture cells, and the mitotic centrosomes. GFP-tagged version of XCdc14α localized to the nucleulus and GFP-XCdc14β localized to the centrosome, although not exclusively. XCdc14α was also both meiotically and mitotically phosphorylated. Injection of antibodies raised against a conserved region of XCdc14/β into Xenopus embryos at the two-cell stage blocked division of the injected blastomeres, suggesting that activities of XCdc14α/β are required for normal cell division. These results provide evidence that XCdc14α/β are required for normal cellular division and are regulated by at least two mechanisms, subcellular localization and possibly phosphorylation. Due to the high sequence conservation between Xcdc14α and hCdc14A, it seems likely that both mechanisms will contribute to regulation of Cdc14 homologs in vertebrates. All dividing cells must replicate their chromosomes and deliver a complement of genetic material to each daughter cell with extreme fidelity. During the latter stages of cell division it is of particular importance that chromosome segregation and spindle positioning are properly coordinated temporally and spatially with cytokinesis. Much of our understanding of how late mitotic events are regulated has come from studies in budding and fission yeast. In the budding yeast S. cerevisiae, a signaling pathway called the mitotic exit network (MEN) initiates mitotic exit only after correct positioning of the spindle in the mother-neck bud [1–3]. The MEN is a GTPase-driven signaling network regulated by the small Ras-like molecule Tem1p that becomes activated upon entry of the yeast spindle pole body (SPB) into the bud . The downstream effector of the mitotic exit network is the Cdc14p dual-specificity phosphatase, which promotes Cdk inactivation by dephosphorylating specific substrates including the Cdk inhibitor Sic1p, the APC activator Cdh1p, and the transcription factor Swi5 [5–7]. Cdc14p activity in S. cerevisiae appears to be regulated primarily through its subcellular localization. During interphase of the cell cycle, Cdc14p is sequestered in the nucleolus by its stoichiometric inhibitor Net1p [8–10] and is released from the nucleolus in two phases during mitosis [11, 12]. The first phase occurs at the metaphase-anaphase transition, when APCCdc20-directed destruction of the anaphase inhibitor securin Pds1 activates the separase Esp1 to initiate sister chromatid separation. Esp1, Slk19p, Spo12p and Cdc5p, collectively known as the FEAR network for Cdc f ourteen ea rly r elease), promote the release of Cdc14 from the nucleolus in early anaphase in a manner that is not well understood [11, 12]. During this first phase, only a subset of Cdc14p is released and transiently localizes to the SPB. It has been postulated that the SPB localization of Cdc14 primes the activity of the MEN, perhaps by dephosphorylating and inactivating the Tem1p GAP inhibitor Bfa1p [11, 12]. The requirement of Esp1 for the first stage of Cdc14 release provides an elegant mechanism to ensure that mitotic exit proceeds only after prior passage through the metaphase to anaphase transition. The second phase of Cdc14 release occurs upon proper spindle orientation and activation of Tem1p, when Cdc14p becomes fully released from the nucleolus and localizes throughout the cell in an activated form. This second phase requires the activity of all gene products of the MEN, although the mechanism by which the MEN promotes Cdc14p release from Net1p is not well understood [8, 10]. No homolog of budding yeast Net1p has been identified in any other species, suggesting that Net1p inhibition of Cdc14p may be unique to budding yeast. In the fission yeast S. pombe, easily identifiable homologues of S. cerevisiae MEN pathway genes regulate the initiation of septum formation during cytokinesis and has been termed the septation initiation network, or SIN . Similar to the MEN, the SIN plays a major role in coupling a late mitotic event (here, cytokinesis) to the prior completion of sister chromatid separation . However, the wiring of the two pathways is distinct. Whereas in S. cerevisiae Cdc14p is the downstream effector of the MEN, in S. pombe the downstream effector appears to be the Sid2p kinase bound to its coactivator Mob1p [14, 15]. Characterization of the S. pombe Cdc14 orthologue, clp1/flp1, led to the surprising conclusion that clp1/flp1 was not required for septum formation since only ~3% of clp1/flp1 null cells displayed characteristic cytokinesis defects, but instead appeared to regulate a cytokinesis checkpoint by arresting cells at the G2/M transition in the event of defective cytokinesis [16, 17]. In addition, clp1/flp1 differed from S. cerevisiae Cdc14p in its localization pattern and substrate specificity. This divergence of Cdc14 function between budding and fission yeast was unexpected and suggested that Cdc14, although highly conserved through evolution, would be likely be co-opted for other functions and perhaps modes of regulation in higher organisms. The lone Cdc14 homologue present in C. elegans was recently shown to be required for central spindle formation and cytokinesis . CeCdc14 localized to the central spindle in anaphase and midbody in telophase, but notably did not localize to the nucleolus or centrosome . This pattern of localization contrasted with that of fission yeast, budding yeast and human Cdc14 homologs (see below), which localize to the nucleolus and spindle pole body at different times in the cell cycle. Several C elegans MEN/SIN homologs were identified based on sequence homology, including BUB2, DBF2, MOB1, and sid1+, but it is not presently understood how they relate to CeCdc14. Humans contain two highly related Cdc14 paralogs (50% identity) that have diverged in function through evolution. Despite their high sequence similarity, the localization patterns of hCdc14A and B differ dramatically, with hCdc14A localizing to the centrosome and hCdc14B to the nucleolus [19–21]. A 54 amino acid peptide present at the very N-terminus of hCdc14B is necessary and sufficient to direct hCdc14B to the nucleolus , whereas hCdc14A contains a nuclear export sequence (amino acids 352–367) required for centrosomal localization . Both hCdc14A and B appear to be dynamic in their subcellular distributions, which is likely a central aspect of their regulation. Disruption of hCdc14A in tissue culture cells by overexpression or depletion using siRNA provides strong evidence that hCdc14A regulates the centrosome duplication cycle and cytokinesis [20, 21]. The function of hCdc14B has yet to be elucidated. The three dimensional structure of the core domain of hCdc14B (residues 44–378) was recently solved by x-ray crystallography both by itself and complexed to a peptide substrate . The most striking feature of the structure is that Cdc14 contains two domains in its N-terminus that are highly related structurally (rmsd of 2.6 Å) despite very limited amino acid conservation (11% identity). Both domains adopt a dual-specificity phosphatase (DSP) signature fold, but only the more C-terminal "B" domain contains the active site Cys and Arg residues. However, the more N-terminal "A" contributes important contact residues from two loops that facilitate peptide substrate specificity. In vitro and genetic analyses and suggest that the Cdc14 family dephosphorylates substrates of cyclin-dependent kinases (Cdk's) [7, 19, 20, 22, 23], whose canonical recognition sequence is (S/T)PXK. However, budding yeast Cdc14p is also able to recognize tyrosine-phosphorylated peptides as substrates . The three dimensional structure of Cdc14 in complex with a peptide substrate provides strong evidence that Cdc14 has a strong preference for phosphoserine/threonine residues located immediately N-terminal to a proline residue, consistent with Cdc14 dephosphorylating Cdk substrates . Despite high sequence conservation, studies in budding and fission yeast, human tissue culture cells and C. elegans have demonstrated that Cdc14 homologs have clearly adopted different functions and mechanisms of regulation. To better understand the role of metazoan Cdc14 and its regulation, we have begun to characterize homologs of Cdc14 from the South African clawed frog Xenopus laevis. We find that XCdc14 proteins localize to both centrosomes and nucleoli and are mitotically phosphorylated. Furthermore, antibody microinjection into Xenopus embryos demonstrates that XCdc14 proteins are essential for cell division. To study Xenopus Cdc14 (XCdc14), we identified and cloned two Xenopus Cdc14 open reading frames. These open reading frames predict proteins with molecular weights of 65.7 kDa and 51.7 kDa (Fig 1A). Since these ORFs are both more closely related to hCdc14A (65.1% and 60.4% identity), rather than hCdc14B (46.8% and 56.9 % identity), and because they are very similar to each other, we called them XCdc14α and XCdc14β. Primary Structure of Xenopus Cdc14α and Cdc14β phosphatases A. Schematic comparison of XCdc14α, XCdc14β and hCdc14A. The gray regions in hCdc14A correspond to the dual specificity phosphatase (DSP) domains identified in the crystal structure of hCdc14B. 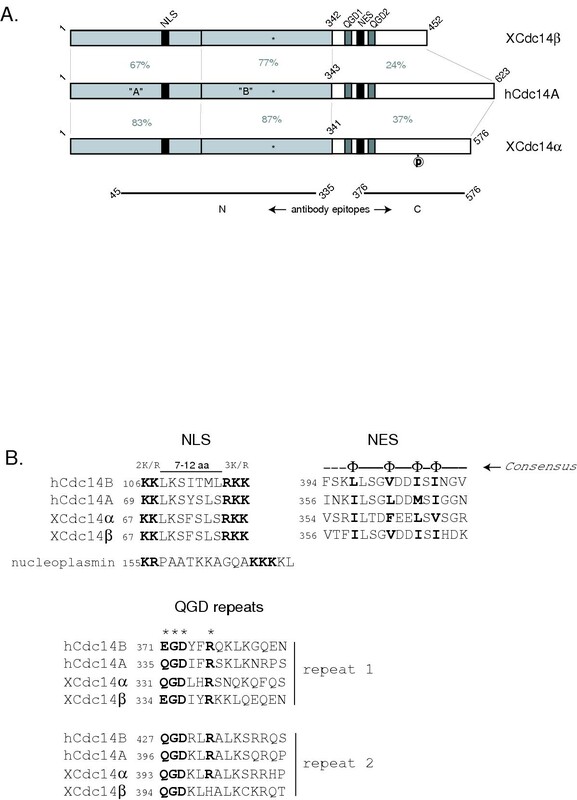 The nuclear export signal (NES), putative nuclear localization signal (NLS), and QGD repeats present in hCdc14A are conserved in XCdc14α and XCdc14β and are represented by shaded boxes. The asterisks represent the active site cysteines, and the circled "p" represents a canonical Cdk phosphorylation site (SPLK) located at residues 443–446 of XCdc14α. The solid lines at the bottom of the figure represent the regions of XCdc14α that were used for immunizations. Percentage identities between the subregions are indicated in grey. B. Alignment of the NLS, NES, and QGD sequences of hCdc14B, hCdc14A, XCdc14α and XCdc14β. Top left: hCdc14A, hCdc14B, XCdc14α, and XCdc14β contain putative bipartite NLS sequences that conform to the consensus motif (R/K)2X7–12(R/K)3,. The sequences are aligned with the bipartite NLS from nucleoplasmin. Top right: Alignment of the NES sequences that are present in all four Cdc14 homologs. The NES of hCdc14A was shown to be functional by mutational analysis . The "φ " in the consensus motif signifies hydrophobic amino acids. Bottom: Alignment of conserved C-terminal QGD motifs. We interested in whether there were also paralogs of human Cdc14B in Xenopus. However, using standard BLAST algorithms (including PSI-BLAST and MEGABLAST), we have not found any obvious hCdc14B paralogs or related homologs in Xenopus laevis. We have also performed similar searches looking for homologs in Xenopus tropicalis, Ciona, and Danio, but none were found. We suspect that the Cdc14B variants are found mostly in mammals. There are several notable features in the XCdc14α/β sequences. The N-terminal "core" region of XCdc14α/β that contains the two dual specificity phosphatase (DSP) domains identified in the crystal structure of hCdc14B  is highly conserved. The non-catalytic domain "A" of hCdc14A is 83% and 67% similar to "A" domains of XCdc14α and β respectively, while the catalytic "B" domain of hCdc14A is 87% and 77% similar to "B" domains of XCdc14α and β respectively. The region of hCdc14A C-terminal to the two DSP domains is less well conserved, sharing 37% identity with xCdc14α and 24% identity with xCdc14β. A putative nuclear localization signal (NLS) and a functional nuclear export signal (NES) are also conserved in XCd14α and XCdc14β (Fig 1B). The NES of hCdc14A, located in residues 352–367, is necessary for hCdc14A localization to the centrosome . It is likely that the NLS of hCdc14A (residues 64–78) is functional, since mutation of the NES or treatment of cells with the nuclear export inhibitor leptomycin B caused a GFP fusion protein to accumulate in the nucleolus [21, 20]. Because subcellular localization clearly plays an important role in the regulation of the human Cdc14 paralogs, we were interested in determining the subcellular localization of XCdc14α/β. We also noticed the presence of two conserved motifs within the C-termini of Xenopus and human Cdc14 (Figure 1B). These motifs contain the sequences QGD and are the only highly conserved regions in the C-termini. These motifs are found in human, frog, and fish, although are not present in the known yeast homologs. The significance of these QGD motifs is currently unknown. To study endogenous XCdc14α protein, we raised polyclonal antibodies against the N- (aa 46–336) and C-termini (aa 377–578) (Fig 2A). The antibody raised against the N-terminus recognized two proteins of 69 kDa and 55 kDa in Xenopus egg lysates, close to the predicted molecular weights of XCdc14α and β (65.9 kDa and 51.7 kDa, respectively). The antibody raised against the C-terminus of XCdc14α only recognized the 69 kDa protein, consistent with the poor conservation of this region between xCdc14α and β (18.4% identity). In addition, both sets of antibodies cross-reacted with hCdc14A, but not hCdc14B (data not shown). Xenopus Cdc14α/β localize to the centrosome and nucleolus. A. Characterization of anti-XCdc14 antibodies. Affinity purified antibodies raised against the N- (aa 46–336) and C-termini (aa 376–577) of XCdc14α were used to Western blot Xenopus egg lysate. Arrows indicate a protein band that cross-reacts with both antibodies and that is competed away by pre-incubation of the antibodies with the immunizing antigen. The asterisk indicates a cross-reacting protein with X46-336 antibodies that partially competed by preincubation. This is likely to represent XCdc14β. B. XCdc14α/β localizes to the centrosome and nucleolus. Antibodies raised against the N-terminus of XCdc14α were used to immuno-stain Xenopus XTC cells. The cells were co-stained with the centrosomal marker γ-tubulin. The arrow in the upper left panel indicates XCdc14α/β localization to the centrosome in an interphase cell. XCdc14α/β localization to interphase nucleoli is also very prominent. C. XCdc14α is imported into nuclei formed in Xenopus embryonic extracts. Interphase Xenopus extracts were incubated with demembranated sperm (1000 sperm/μl) in order to induce nuclear formation. The time course was started by moving the reaction tubes to 23°C, and at the indicated times (in minutes) samples were diluted and centrifuged through a sucrose cushion to separate cytosolic and nuclear fractions. A sample from the top of the cushion was taken for immunoblot analysis ("cytoplasm"). The cushion was aspirated, the pellet was washed and centrifuged, and the entire pellet ("nuclei") was loaded on SDS PAGE for subsequent immunoblotting with anti-XCdc14α antibodies. In vitro translated and 35S-labeled Xic1 was used as a positive control for nuclear formation and import (bottom panels). Xic1 was imported into the nucleus and destroyed by 55 minutes. Ubiquitinated forms of Xic1 can be seen in the nuclear fractions. Using antibodies raised against the N-terminus, we determined the localization pattern of XCdc14α/β in Xenopus XTC cells using indirect immunofluorescence (Fig 2B). Because these antibodies detect both XCdc14α and XCdc14β on Western blots, we strongly suspect that these antibodies see both endogenous proteins. The C-terminal antibodies specific for XCdc14α did not work for immunofluorescence. Interestingly, XCdc14α/β proteins localized to both the nucleolus and centrosome in interphase cells, as demonstrated by co-localization with nucleolin (data not shown) and γ-tubulin (Fig 2B). During mitosis XCdc14α/β remained associated with both centrosomes, and we consistently observed that more XCdc14α/β appeared to accumulate at mitotic centrosomes compared to interphase centrosomes (Fig 2B and data not shown). Thus, it is possible that in Xenopus tissue culture cells the majority of XCdc14α/β is sequestered in the nucleolus during interphase and then localizes to the centrosomes upon nucleolar breakdown in mitosis. XCdc14α/β did not localize to the central spindle in anaphase or the midbody in telophase, as has been observed for C. elegans . We do not know whether the antibodies recognized a single Cdc14 homolog localized to both the nucleolus and centrosomes, or two paralogs that each localize to one of these sites. To help determine which Cdc14 homolog localized to each location, we constructed GFP-tagged versions of both XCdc14α and β and transfected them into Xenopus XTC cells to determine the localization of each (Figure 2C). Although each of the expressed proteins showed some diffuse localization, the XCdc14α homolog did localize to the nucleoli in many cells, as seen by comparison with excluded region of Hoescht staining (see merge). In contrast, the XCdc14α homolog showed some nuclear and possibly nucleolar localization, but did show accumulation at centrosomes, as evidenced by colocalization with γ-tubulin. Thus, the two Xenopus Cdc14 isoforms show localization to similar localizations as human Cdc14A and Cdc14B. In addition to immunofluorescence staining of Xenopus tissue culture cells, we examined the cytosolic and nuclear distribution of the specific XCdc14α protein in embryonic extracts. Demembranated Xenopus sperm (1000/μl) was added to interphase Xenopus extracts to induce nuclear formation, and at various times cytosolic and nuclear fractions were isolated by centrifugation over a sucrose cushion. A substantial amount of XCdc14α present in the extracts was imported into the nuclei (Fig 2D). As a control for nuclear formation and import, we added in vitro translated, 35S-labeled Xic1 to the assay, which was imported into nuclei and rapidly destroyed (Fig 2C). Because this fractionation technique isolated intact nuclei we were not able to determine whether the XCdc14α imported into the nuclei localized to the nucleoli, as in somatic Xenopus cells. We next examined XCdc14α in fertilized Xenopus embryos. XCdc14α protein levels were stable during development through embryonic stage 27 (Fig 3A), as well as throughout the early embryonic cell cycle (Fig 3B). In this regard XCdc14α behaves in a similar manner to S. pombe, S. cerevisiae and both human Cdc14 homologs, all of which appear to be stable throughout the cell cycle. Interestingly, we observed that XCdc14α was mitotically modified in the Xenopus extracts, demonstrated by a distinctive mobility shift in SDS PAGE (Fig 3B). This modification is consistent with the phosphorylation of human Cdc14A that we have observed in cells and in vitro (BKK and PKJ, manuscript in preparation). The mobility shift coincided with mitotic entry as determined by total histone H1 kinase activity (Fig 3B) and DNA morphology of an exogenous sperm DNA template (data not shown). In the majority of extracts analyzed, XCdc14α was modified concomitant with maximal histone H1 kinase activity and was rapidly dephosphorylated upon exit from mitosis. This would be consistent with phosphorylation by active Cdc2, which in vitro is able to phosphorlate both human Cdc14A and Xenopus Cdc14α. XCdc14α is mitotically phosphorylated during oocyte maturation and in the Xenopus embryonic cell cycle. A. XCdc14α protein levels are constant during development. Xenopus eggs were fertilized in vitro and at the indicated stages were frozen down for subsequent immunoblot analysis. B. XCdc14α is phosphorylated in mitosis in cycling Xenopus extracts. 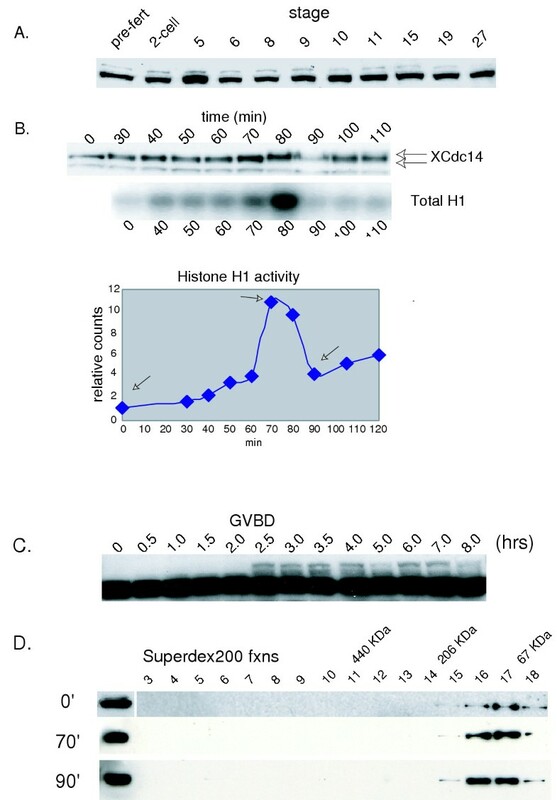 At the indicated times, samples from cycling extracts were frozen in liquid nitrogen for subsequent immunoblot analysis with anti-XCdc14α antibodies (top panel) and total histone H1 kinase activity (lower panel). For the immunoblot, lysates were resolved on 11% SDS PAGE gels. C. XCdc14α becomes phosphorylated after germinal vesicle breakdown (GVBD) in the maturing oocyte. Defolliculated Stage VI oocytes were induced to mature by the addition of progesterone (10 μg/ml). At the indicated times, oocytes were flash frozen for subsequent immunoblot analysis with antibodies against XCdc14α. GVBD occurred between 2 and 2.5 hrs. D. The majority of XCdc14α is monomeric or dimeric through the cell cycle. At 0, 70 and 90 min, samples from cycling extract were flash frozen in liquid nitrogen. Left: samples from the cycling extract were tested for total histone H1 kinase activity. Arrows indicate timepoints that were analyzed. Right: The frozen samples were diluted 10-fold in XB buffer, and 50 μg (1 μl equivalent of undiluted lysate) was fractionated on a Superdex200 gel filtration and probed with anti-XCdc14α antibodies. The elution profiles of molecular weight standards are depicted above the fractions. We also analyzed the state of XCdc14α modification in maturing oocytes. During oocyte maturation, passage through Meiosis I correlates with germinal vesicle breakdown (GVBD, ), which provides a convenient visual marker that appears as a white spot on the animal pole of the oocyte. Shortly before GVBD Cdc2 activity dramatically increases. In stage VI oocytes induced to mature by progesterone, a fraction of XCdc14α consistently became hypermodified concomitant with GVBD and remained modified until the oocytes arrested at metaphase of Meiosis II (Fig 3C). We also examined XCdc14 modification in cytostatic factor (CSF)-arrested extracts from Xenopus eggs, which are stably arrested in metaphase of Meiosis II and can be released into interphase by the addition of CaCl2. Reproducibly, a fraction of XCdc14α was modified in CSF-arrested extracts and was rapidly lost modification upon release by calcium addition (data not shown). Thus, under both meiotic and mitotic conditions XCdc14α is hypermodified, which we strongly suspect is phosphorylation. Although we have not identify a kinase(s) responsible for XCdc14α phosphorylation, the presence of a consensus Cdk phosphorylation site in the C-terminus of XCdc14α (Fig 1A) suggests that Cdc2 is at least one kinase responsible for this phosphorylation. Additional studies suggest that the human Cdc14A is an efficient Cdk substrate in vitro, is likely to be phosphorylated in vivo, and that hCdc14A has autophosphatase activity directed toward those Cdk phosphorylation sites (B. Kaiser et al, 2002; B. Kaiser and P. Jackson, manuscript in preparation). Phosphorylation could regulate XCdc14α on several levels, including its intrinsic phosphatase activity. However, we have not yet been able to measure XCdc14α phosphatase activity at different stages in the cell cycle from Xenopus cycling extracts. Similar experiments in human cells suggested that the intrinsic activity of Cdc14A did not vary significantly through the cell cycle. Another possibility is that the phosphorylation state of XCdc14α might regulate its assembly into higher order complexes. In order to test this idea, we fractionated Xenopus egg lysate from different points in the embryonic cell cycle on a Superdex200 analytical sizing column (Fig 3D). In interphase extract (0 min), mitotic extract (70 min), or extract that had recently exited mitosis (90 min), the majority of XCdc14α eluted as relatively small complexes (~67–200 kDa, Fig 2E). Since budding yeast Cdc14p and hCdc14A appear to form homodimers ( and data not shown), it is possible that at least some of XCdc14α from these fractions existed as a dimer. Thus, the multimerization of XCdc14α does not appear to change dramatically in cycling extracts of early embryos. In order to test the effect of XCdc14α/β loss of function on cell division we microinjected affinity purified rabbit antibodies that were raised against the N-terminus of XCdc14α into one cell of a two cell Xenopus embryo (Fig 4). Injection of anti-XCdc14α N antibodies, but not anti-XCdc14α N antibodies that were pre-incubated with the immunizing antigen ("blocked"), or purified IgG, caused a reproducible large blastomere phenotype. This result suggests that interfering with endogenous XCdc14α/β perturbs normal cellular division. Although we do not specifically know at which stage in the cell cycle the embryos were blocked, the results are consistent with a block to cytokinesis. Injection of GST-hCdc14A protein had no effect on the dividing embryos. We also attempted to downregulate endogenous XCdc14α protein levels by injection of siRNA's directed against XCdc14α into Xenopus embryos, but were unsuccessful. In addition, we attempted to immunodeplete XCdc14α from embryonic cycling extracts, but none of the antibodies we tested were able to reproducibly deplete XCdc14α quantitatively. Nonetheless, the loss of function phenotype induced by antibody microinjection suggests that that XCdc14α/β are critical regulators of cell division. Injection of anti-XCdc14α/β antibodies into Xenopus embryos blocks cell division. One cell of 2-cell Xenopus embryos was injected with 10 nL of XB Buffer, purified rabbit IgG (final concentration ~1 μM), anti-XCdc14α/β antibodies (~200 nM final concentration), anti-XCdc14α/β antibodies pre-incubated with the immunizing antigen ("Blocked"), or GST-hCdc14A (1 μM). Left: examples of embryos injected with α-XCdc14α/β antibodies (top) or pre-blocked α-XCdc14α/β antibodies. Right: summary of two independent experiments. Embryos were analyzed at the 32-cell stage, and only embryos with an obvious large blastomere phenotype were considered abnormal. Here we present the initial characterization of XCdc14α and XCdc14β, the Xenopus homologs of a cell cycle regulatory phosphatase described in budding and fission yeast, worms, Drosophila, and humans. As the first step in studying XCdc14, we characterized two cDNAs encoding variants of Cdc14 most closely related to human Cdc14A. These were called Xcdc14α and Xcdc14β. The two known forms of human Cdc14 are hCdc14A, which localizes to the centrosome and appears to have a role in cytokinesis [20, 21] and hCdc14B, which localizes to the nucleolus, where its function is unknown . Antibodies raised against Xenopus Cdc14α protein showed staining of both centrosome and nucleolus suggesting that similar protein variants exist in anurans. Examination of the modification of XCdc14α suggested that the protein is modified, probably by phosphorylation, in a cell cycle-dependent fashion, consistent with cell cycle regulation of the protein. Further, inactivation of the proteins in fertilized Xenopus embryos showed a block to cell division, possibly at cytokinesis, consistent with the roles of the protein in human cells. Immunofluorescence analysis of fixed XTC cells revealed that XCdc14α/β are localized to both nucleoli and the centrosome in interphase, and accumulated at the mitotic centrosomes. This pattern of localization most closely mirrors that of S. pombe flp1/clp1, with the major difference being that clp1/flp1 also localizes to the ring neck during cytokinesis. We did not observe XCdc14α/β localizing to the central spindle in anaphase or the midbody in telophase, as reported for C. elegans Cdc14 . Interestingly, the localization pattern of our antibody staining is a hybrid of hCdc14A and B localization patterns, with hCdc14A localizing to the centrosome and hCdc14B to the nucleolus. It is likely that the antibodies used for these studies, which were raised against the conserved N-terminal region, recognize both Xenopus Cdc14α and β and that only one form localizes to the centrosome and the other to the nucleolus. It is currently unclear how S. pombe Clp1 protein, hCdc14B and either XCdc14α/XCdc14β are tethered to the nucleolus. S. cerevisiae Cdc14p is sequestered in the nucleolus by the Net1p inhibitor, but no Net1p homologs have been identified in any other species. It therefore seems likely that distinct nucleolar components bind to human and Xenopus Cdc14. A potential candidate is the nucleolar protein Bop1 (block of proliferation 1), which is required for ribosome biogenesis . Bop1 is highly related to budding yeast Erb1 (36% identity), which is also required for ribosome biogenesis in budding yeast and was identified as a Cdc14p-binding protein in a large scale protein-interaction mapping survey of the budding yeast genome . A cis-acting 54 amino acid peptide present in hCdc14B is both necessary and sufficient for its nucleolar localization . Mice contain clear homologs to hCdc14A (86.7% identity) and hCdc14B (85% identity), and murine hCdc14B contains a 54 amino acid N-terminal extension very similar to hCdc14B, suggesting that muCdc14B also localizes to the nucleolus. However, neither XCdc14α nor XCdc14β contain an analogous sequence. It is clear from studies in budding and fission yeast and mutational analysis of hCdc14A that Cdc14 homologs are able to localize to the nucleolus without this peptide. The nucleolar localization that we observe in Xenopus apparently does not require such a sequence. We also examined XCdc14α protein levels throughout oocyte development and through one mitotic cell cycle in an embryonic extract. We found that XCdc14α protein levels are relatively constant throughout the cell cycle and early Xenopus development, consistent with all other Cdc14 homologs studied to date, but that XCdc14α is both meiotically and mitotically modfied. During oocyte maturation, we consistently observed a fraction of XCdc14α that was hypermodified after GVBD. In synchronized cycling extracts, XCdc14α was reproducibly modified concomitant with mitotic entry and rapidly lost modification upon mitotic exit. It is not clear how this modification or phosphorylation regulates XCdc14α. We have not yet been able to determine whether phosphorylation affects XCdc14α intrinsic phosphatase activity. We tested the possibility that phosphorylation causes XCdc14α to form higher order complexes but found no difference based on the elution profile of XCdc14α using analytical gel filtration from samples at different stages in the embryonic cell cycle. Another intriguing possibility is that phosphorylation regulates the subcellular distribution of XCdc14α. While we do not yet understand how this phosphorylation regulates XCdc14α activity or localization, in vitro we have found that hCdc14A is able to autodephosphorylate (BKK and PKJ, manuscript in preparation), providing a potential mechanism to allow rapid reversal of Cdc14 mitotic phosphorylation. Injection of antibodies against XCdc14α/β into Xenopus embryos also provides compelling evidence that XCdc14α/β are required for cell division. However, it is not yet clear at which stage of the cell cycle XCdc14α/β are acting. This will be an important question to address, since Cdc14 homologs appear to act at distinct cell cycle phases in different organisms. S. cerevisiae Cdc14p triggers mitotic exit, S. pombe flp1/clp1 appears to act as part of a cytokinesis checkpoint by regulating the G2/M transition, and C. elegans Cdc14 appears to be required for cytokinesis. Valuable information concerning the function of Cdc14 homologs stands to be gained from study of genetically tractable organisms, particularly drosophila and mice. In this study, we have begun to analyze the Cdc14 homologues in Xenopus laevis. 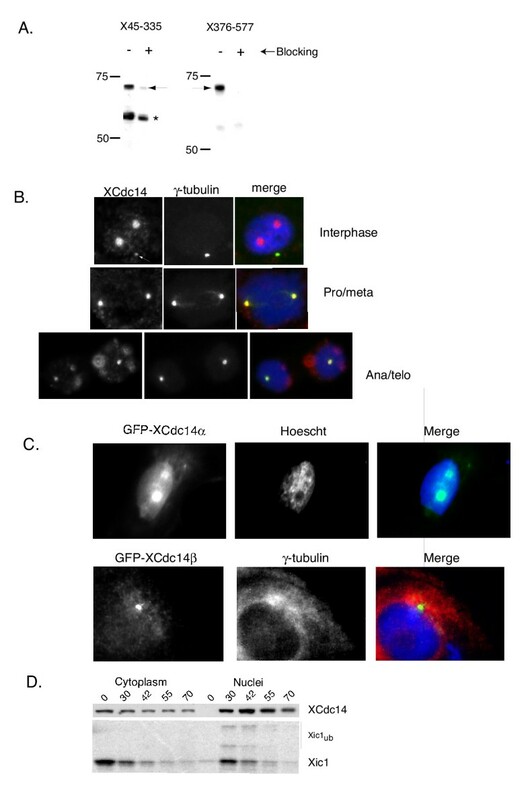 We show that Xenopus paralogs of cdc14, called XCdc14α and XCdc14β localize to both the centrosome and nucleolus, and XCdc14α is mitotically and meiotically modified. In addition, Xcdc14α/β appear to be required for normal cell division. These results further our understanding of the role of Cdc14 in metazoan cell division. Further studies of Xcdc14α/β will enhance our understanding of the function and regulation of human Cdc14 proteins. Degenerate primers designed against the sequence FYADFGP (hCdc14A aa 34–40) and SIIGPQQ (hCdc14A aa 301–307) were used to amplify a partial ORF from a first-stranded cDNA from stage VI Xenopus oocytes (prepared using Clontech's SMART cDNA synthesis kit). Using this strategy we isolated a cDNA corresponding to aa 46–274. Using 3' RACE (Clontech), we isolated the entire 3' end of the gene encoding XCdc14α. Several EST's in the NCBI public database were identified that encoded the remainder of the N-terminus of XCdc14α. Database searches then identified a second Xenopus homolog (dbEST id 16573833, gi:27520396) named xCdc14β. GST fusion proteins of XCdc14α N-(aa 45–335) and C-(aa 376–577) were expressed and purified in bacteria for antisera production in rabbits (Josman Immunoresearch) and were affinity purified against MBP fusion proteins coupled to CNBr-activated sepharose (Amersham Pharmacia Biotech). For blocking experiments, antibodies were incubated at room temperature for 1 hour with a five-fold molar excess of cleaved antigen, spun at top speed in an Eppendorf centrifuge for 10 minutes, and used for either immunofluorescence or Western blotting analysis. 11% SDS PAGE gels were required to resolve phosphorylated forms of XCdc14α. XTC cells were grown in Leibowitz's media with 10% FBS, 100 U/mL penicillin and 100 μg/mL streptomycin, and incubated at 25°C in the absence of any additional CO2. For immunofluorescence, cells were grown on 12 mm coverslips treated with fibronectin. Prior to fixation, cells were extracted with 1X CSK buffer (10 mM Pipes, pH 7.0, 300 mM sucrose, 100 mM NaCl, 1 mM EGTA, 3 mM MgCl2) containing 0.1% Triton-X 100 for 4 minutes, washed three times for 5 minutes each with PBS, then fixed for 15 minutes in 4% paraformaldehyde in PBS. Cells were then washed 3 times five minutes each with PBS before proceeding with blocking and incubation with primary antibodies. Cells were stained with antibodies raised against XCdc14α (45–335) and were co-stained with mouse monoclonal antibodies against γ-tubulin (Sigma clone GTU-88) or nucleolin (Research Diagnostics, clone 4E2). Interphase and cycling extracts were prepared as described . For cycling extracts, eggs were activated with the calcium ionophore A23187 (Sigma-Aldrich) in MMR at a final concentration of 0.5 μg/mL (20,000 fold dilution of 10 mg/mL single use aliquots, made up in DMSO). Typically eggs took 2–3 minutes to activate. Once activated, the eggs were washed three times in MMR, three times in XB buffer, then in XB buffer supplemented with leupeptin, pepstatin and chymostatin (LPC) at a final concentration of 10 μg/mL and cytochalasin D at a final concentration of 10 μg/mL. All subsequent manipulations were done at 4°C or on ice. After a packing spin to remove excess buffer, the eggs were crushed in an HB-6 rotor for 10 minutes at 10,000 rpm. The LSS was then clarified by centrifuging top speed in a 1.5 mL eppendorf tube for 10 minutes. Extracts were supplemented with an energy mix prior to use. A 20X energy mix consisting of 20 mM ATP (Sigma), 20 mM MgCl2, 150 mM phosphocreatine (Boehringer Mannheim) and 2 mg/mL creatine kinase (Boehringer Mannheim) was stored in aliquots at -80°C. For cycling extracts, the time course was started by moving tubes from ice to 23°C. At each time point, 1 μl of extract was removed for DNA morphology by adding demembranated Xenopus sperm to a final concentration of 1000/μl, 1 μl was flash frozen in liquid nitrogen for total histone H1 kinase activity, and 2 μl was diluted into 20 μl of 2X sample buffer for SDS PAGE and western blotting. Typically, 0.5 μl equivalents of extract (~25 μg total protein) was loaded on SDS PAGE. Nuclear spin downs were performed as described . Sperm were used at 1000/μl final concentration. At each time point, 10 μl reactions were diluted with 50 μl of ELB (250 mM sucrose, 2.5 mM MgCl2, 50 mM KCl, 10 mM Hepes, pH 7.7, 1 mM DTT), loaded onto a sucrose cushion (170 μl) consisting of ELB supplemented with 500 mM sucrose, and centrifuged for 20 seconds in a Beckman 152 microfuge. 10 μl of the very top of the cushion was taken and added to 10 μl of 2X SB, and the pelleted nuclei were washed with ELB and resuspended in 10 μl of 2X sample buffer. The entire pellet containing nuclei was loaded on SDS PAGE for immunoblot analysis. CSF extracts were prepared in XB+5 mM EGTA and were released into interphase by the addition of 1 mM CaCl2. Samples were taken for DNA morphology, total H1 kinase activity, and SDS PAGE. Oocytes maturation was carried out as described . In a typical experiment, 1 μl of extract was flash frozen in liquid nitrogen and stored at -80°C. The sample was then thawed on ice, and 9 μl of H1 kinase buffer (80 mM β-glycerophosphate, pH 7.4, 15 mM MgCl2, 20 mM EGTA, 0.1% NP-40, 15 μg/mL benzamidine, 1X LPC) supplemented with 0.125 mg/mL Histone H1 (Sigma) and 0.6 μCi [32P]-γ-ATP was added and triturated. The samples were incubated 10 min at 25°C and stopped with 30 μl of 2X sample buffer. 10 μl of this stopped reaction was then resolved on 14% SDS PAGE and exposed to a phosphorimager. To fertilize embryos, eggs were freshly squeezed from Xenopus females into a petri dish containing 1X MMR (100 mM NaCl, 2 mM KCl, 1 mM MgCl2, 2 mM CaCl2, 0.1 mM EDTA, 5 mM Hepes, pH 7.5). Just before fertilizing the eggs the majority of the liquid was pipetted off. Xenopus testes (less then one week old) were minced in 1X MMR with #5 filter forceps and pipetted onto the eggs (about 1/3 of a testes was used per fertilization), and after 1–2 minutes, water was added to fill the petri dish. After 15 minutes of incubation, the eggs were de-jellied in 3% cysteine, pH 7.8 (usually takes ~10 minutes), and the embryos were then washed several times in 0.3X MMR. Embryos were incubated at 23°C in 0.3X MMR. At each time point, 5 embryos were frozen down for subsequent analysis by SDS PAGE..
Microinjections in Xenopus embryos were performed with a Picospritzer II (Microgel). Each needle was calibrated such that 10 nl was injected. BKK carried out the molecular, cellular and biochemical studies, and drafted the manuscript. MVN carried out the sequencing of the complete cDNAs, the sequence alignment and participated in the writing of the manuscript. BEG contributed to the preparation and characterization of the antibodies and preparation of Xenopus extracts. PKJ helped to conceive the study and contributed the funding for the project. All authors have read and approved the final manuscript.